For countries using 230VAC only. In a steel case a fully installed change over grid electrical box. content :a kWh meter ,a 12VDC/230VAC 0.8kW inverter(square wave),a bi pole 230VAC relay contactor,a low &high level battery sensor,a general control switch and a green light indicating when the system is powered by Motorwind using only standard components that any certified electrician can replace anywhere in the world. function: when the battery level is high the inverter powers the electrical appliances.when the battery level becomes too low the system switches automatically back to the grid avoiding any interruption. the inverter will only start if the battery voltage reaches approx 13.5 volts and keep working until the battery level goes down to approx 11 volts.at approx 11 volts the inverter shuts down and will only restart when the battery is recharged. for a 3.5 amperes 230VAC application use a 200 amph battery. for a 2.5 amperes 230VAC application use a 150 amph battery. for a 1 ampere 230VAC application use a 50 to 60 amph battery. Box :50 cm x 25 cm x 20 cm approx 7 kgs. content :a kWh meter ,a 12VDC/110VAC 0.8kW inverter(square wave),a bi pole 110VAC relay contactor,a low &high level battery sensor,a general control switch and a green light indicating when the system is powered by Motorwind using only standard components that any certified electrician can replace anywhere in the world. for a 3.5 amperes 110VAC application use a 100 amph battery. for a 2.5 amperes 110VAC application use a 75 amph battery. for a 1 ampere 110VAC application use a 25 to 30 amph battery. Warning:depending on countries,connection to the grid can only be done by certified electricians. the system must not be modified and only used as explained in the instruction manual. the system is design for the grid and inverter power cables to never come in contact. this an absolute condition to avoid any authorization from your local power company to do the connection. 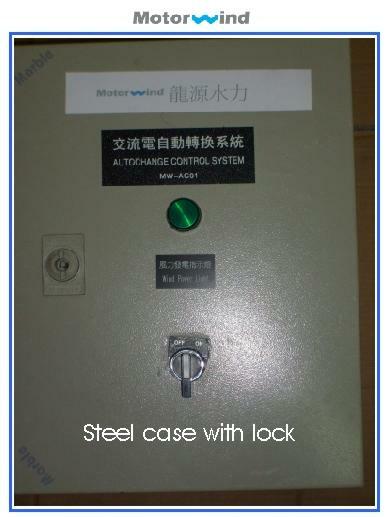 We can also supply electrical box with more than one inverter.contact us for special requirements.